Each week on Football FanCast we will be celebrating that special breed who lit up the Premier League with their unique brand of utter genius. This time out we pay homage to a controversial figure who routinely amazed. Luis Suarez bit, dived and cheated. He was at the centre of an unsavoury race row. He could find controversy in a bowl of Crunchy Nut Cornflakes or an otherwise empty elevator. We knew all of this when he arrived, from Ajax to Liverpool in January 2011 for a fee of £22.8m. His reputation flew in separately with its own baggage. We also knew he was a formidably talented striker. We had no idea how bad he was though. Or good. Good? That doesn’t do him justice. Suarez was consistently and mind-bogglingly amazing. He was capable of the extraordinary; capable of breaking the spirit of eleven men single-handedly. As for his character – let’s call it that – his antics and fierce, seemingly purposeful antagonism was never anything less than engrossing. To rival fans he was a pantomime villain. To Liverpool fans he was a buck-toothed deity. Frankly the Premier League has been a little bit boring since he departed for La Liga. Every league needs an anti-hero. 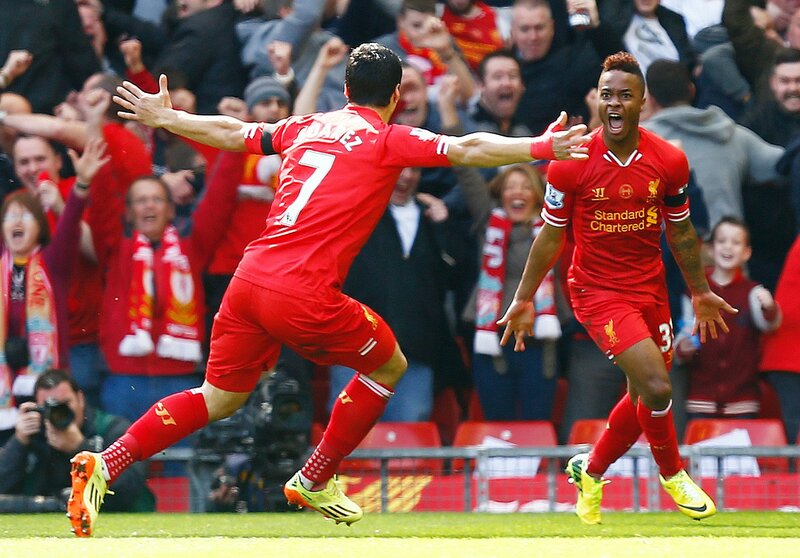 In his three and a half years on English soil the Uruguayan scored a hat-trick every 20 Premier League games. He twisted defenders into knots and bolted after lost causes, making them found. He fired in shots from every angle and distance, sometimes with stinging venom, sometimes curled, more times than not lethal and accurate. He was selfish when it was right to be and elsewhere had awareness more in keeping with a midfield schemer. He was tenacious and gnarly. Not that he was lacking in aerial threat – Suarez is after all six foot in his socks – but add a couple of inches to him and he’d be the perfect modern day centre-forward. It would be disrespectful to his team-mates to suggest that in 2013/14 he came so close to winning Liverpool a league title all on his own. But in 2013/14 he came so close to winning Liverpool a league title all on his own. That year Suarez was immaculate and immense. He was everywhere and everything to a ferocious and exhilarating side that attacked as a default. What’s more his demons seemed to have dissipated, or at least they shuffled over to the passenger seat for a while. The deplorable charge of racially abusing Patrice Evra was not consigned to the past but now mainly resided there. The ten-match suspension for biting Branislav Ivanovic – a temporary loss of senses that even had Prime Minister David Cameron frothing at the mouth – had been served by that September. The summer’s drawn-out sulk – that began as a wish to get away from an intrusive English media and almost ended with a move to Arsenal and London, the heart of the English media – was resolved. From September forward Luis Suarez the footballer took centre stage and rocked it to its foundations. He scored thirty goals, securing the Golden Boot comfortably. He clean swept the personal awards becoming the first non-European player to win the PFA Player of the Year. He was unplayable. As goodbyes go it was as spectacular and prolonged as is feasibly imaginable. It is December 4th 2013 and Norwich City head to Anfield tremulous at the prospect of facing a striker who had already scored hat-tricks against them in the preceding two seasons. Here he bags four, putting in a masterclass so special it barely registers that he also provides an assist for the fifth. His second and third are low blasted efforts beyond the reach of the sympathetic figure of John Ruddy in nets. His fourth is a marquee free-kick, whipped and perfect. 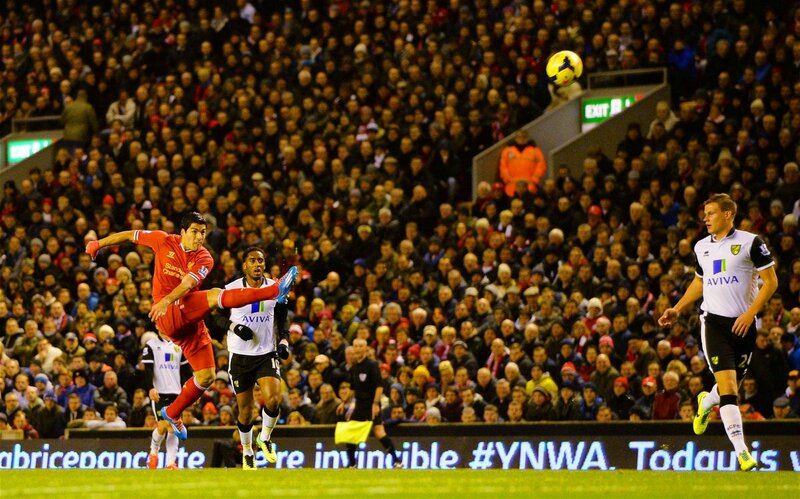 But it’s Suarez’s first that delights the most; an arcing, dipping howitzer from a full forty yards. Watching it back brings it all back: the eerie feeling that you’re witnessing a level of football previously unseen from thousands of hours of normality. It’s a goal that lends itself to a contradiction, and that is by admitting the ball sit ups nicely, just begging to be thwacked, while Ruddy is off his line. It’s a situation then that many strikers would attempt to take full advantage of. It’s just that nobody else could pull it off. There is contradiction too in its description because really the strike is absolutely ordinary in its brilliance consisting of a long-range thunderbolt. That’s it really. Suarez receives the ball, he lets it bounce twice, then unleashes a powerful shot that sails for two full seconds through the Merseyside air, leaving Ruddy scrambling in desperation. Yet there are two aspects that astound. The first is that the delivery is so exact the ball actually lands into the very corner of the net. It couldn’t have been weighted better. 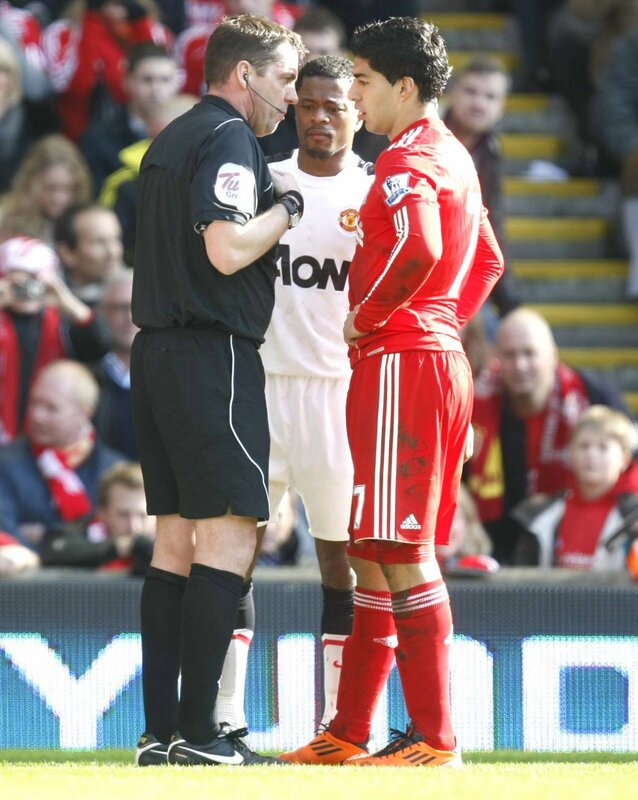 The second is Suarez’s posture immediately after contact. His leg swings violently to the side. He hasn’t hit it. He’s walloped it. Everything was done full measure with Luis Surez. The good, the bad, the bloody brilliant. Admit it, we miss him.